Wow! 31 Powerful Tips & Home Remedies for Fast Weight Loss! Weight gain is something that usually creeps up on you very slowly. You first start to notice your pants becoming a little tighter around the waist, or your shirt becoming a bit “snug” around the belly area. But you’ll usually just dismiss this and the next time you go to buy clothes, you'll find that you need to move up a size. This can go on for months and even years (consistently putting on weight and slowly moving up in clothes sizes) before you get to a point where you say, enough is enough. Because you’re here looking for natural ways to lose weight, I’m guessing you’re at that point (which is a good thing too by the way). When it comes to weight loss, this undertaking seems to make many people cringe just at the very thought! But losing weight isn’t actually that complicated. All you have to do is burn off more calories than you take in. So there you go. That’s all you need to know… end of story! Okay, I know it’s not as simple as that. There are other factors that govern how you lose weight, but the equation is correct. The problem is you have to get your metabolism to speed up sufficiently to be able to burn enough calories to lose the weight or you're destined to live off salad and veggies for the rest of your life! The way it works is you need to expend more energy (calories) than what you take in. When you do this, your body will draw on its own stored fat deposits and use this for energy rather than food. This in turn causes your fat cells to shrink. So there are basically two ways to speed up your metabolism. The first way is through eating a specific diet that allows your metabolism to increase naturally. Weight loss companies such as Sureslim, Cohen’s, Light and Easy, and even Jenny Craig use this type of program with great success. The problem is they are expensive and super strict, but they do work. The other way is through a combination of moderate exercise and healthy eating. I tend to favour this one. After being involved in the health and fitness industry for almost 30 years, I can tell you that trying to lose weight by healthy eating alone is extremely tough. You have to be very disciplined, and most people aren’t. With the combination of exercise and healthy eating, you’ll still lose weight consistently every week, but you can also allow yourself a treat every now and then and get away with it. Of course, you still have to be disciplined to exercise and eat well, but you get that little bit of extra freedom. And the exercise you do doesn’t have to be like what you see on the Biggest Loser. Sure, these people lose ridiculous amounts of weight, but they exercise for 4-6 hours a day, put themselves through unimaginable pain, and almost kill themselves in the process! A brisk walk, cycling, using the cross trainer or spending some time in the gym is usually enough. Just make sure you get “huffy and puffy” for forty five minutes to an hour, 5-6 days a week. There’s an old saying in the weight loss industry… “The more you drink the more you shrink”. Water is your most important friend as far as losing weight and keeping it off. It acts as an appetite suppressant by keeping your stomach full and also helps your body to metabolize and break down stored fat by helping the kidney’s flush out waste. Make sure you drink iced water though (at least 2 litres a day) and not room temperature water. Your body will burn between 60 and 100 calories alone just heating up the water to body temperature. And very often hunger pangs are actually thirst pangs so drinking lots of water will also help to stop overeating. In addition, adding a slice of lemon will not only make the water taste good, you also get the added benefit of the lemon cleansing and detoxing your liver (see #11 home remedy for weight loss), which helps to speed up the fat burning process even more. If you like your spicy food then you’re in luck. Chilli’s and mustard are also strong thermogenics and have a long history in helping with weight loss. They’ll easily boost your calorie burning capacity by 10% for up to 2 hours after eating. The reason? They contain a substance called capsaicin, which speeds up the body’s metabolism dramatically! Keep in mind that red chillies, particularly cayenne pepper, are the best fat burners of them all. Along with adding them to your food, mix a teaspoon of cayenne pepper in half a glass of warm water. Scull down then drink another glass of cold water (be sure to have it at the ready) to cool down your mouth. Do this 2-3 times a day on an empty stomach, especially one hour before your daily exercise. It works an absolute treat for weight loss! Note: If you find you really can’t handle the heat from the cayenne pepper, you can easily purchase this spice in capsule form. They work just as well. Fibre can absorb up to 10 times its own weight. The good thing about fiber is it not only makes you feel full so you eat less, it also absorbs fat as well. The down side to fibre is it can also absorb the good fats (essential fatty acids) and vitamins and minerals so be sure to have your nutritional supplements at times when you aren’t consuming any fiber. Calcium helps encourage the release of fat from fat cells as well as reducing the amount of fat the body absorbs. Best sources are a good quality coral calcium supplement or chelated calcium with added vitamin D and magnesium. Whatever you do though, do not consume dairy foods for calcium. This type of calcium is difficult for the body to digest and processed dairy foods will actually have the opposite effect and make you put on weight, not lose it. You’ve probably already seen or heard about most of the Detox diets doing the rounds at the moment. There’s definitely quite a few of them. The reason detox diets work is they flush out and cleanse the body, particularly eliminatory organs such as the liver and kidneys. This then allows these organs to work at maximum efficiency and so you naturally shed weight (fat) quicker. Excellent Detox foods include; cereal grasses, lemons, grapefruits (these also contain an enzyme which accelerates fat loss), cucumber, mint, cherries, strawberries, grapes, prunes, apricots and cranberries. Do yourself a favor and invest in a Nutribullet or Nutri Ninja. These appliances are terrific for making your own detox and weight loss drinks and smoothies (and so easy to use). Apple cider vinegar is a powerful weight loss remedy. It helps to break down fat in the body, particularly brown fat (the one you want to get rid of) and also normalizes blood sugar and insulin levels. In addition, a compound in ACV known as acetic acid interferes with the body’s ability to digest starch, which means less is broken down and stored as body fat. The best way to take apple cider vinegar for weight loss is one tablespoon mixed in a glass of warm filtered water and drank 10 minutes before a main meal. Do this 3 times daily for best results. Just make sure you only use organic raw, unfiltered ACV containing the “mother” apple (such as these ones). And if you find you can’t stomach the liquid ACV, you can substitute it for the apple cider vinegar capsules, which work equally as well. If you haven’t read the hugely successful weight loss book “The Liver Cleansing Diet” by Dr Sandra Cabot, I highly recommend you do. Dr Cabot’s theory is that a poor functioning liver (“fatty liver”) is the main cause of people gaining weight, as well as not being able to lose weight. She’s definitely right on the money with this one. Research has shown that a sluggish liver can slow weight loss by at least 30%. I’ve already mentioned how important detoxification is for weight loss, and detoxifying the body’s biggest eliminatory and fat burning organ (the liver) is the most important of them all! And that’s where the potent milk thistle herb comes in. This herb is a super impressive liver detoxifier, cleanser and repairer. 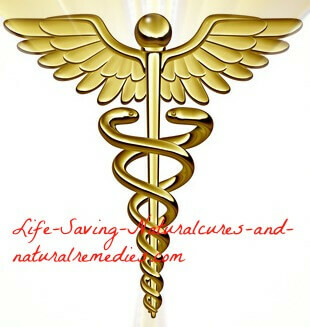 In fact, it’s one of the standard ingredients listed in most natural liver tonics. You can easily buy it in capsule form from most good health food stores or online from places such as Amazon.com. For dosage amounts, follow the directions on the bottle. Lemon juice is an old folk remedy for weight loss that grandma would have used. It helps with liver detoxification and fat metabolism. Black pepper contains a compound called piperine, which helps reduce fat levels in the blood. 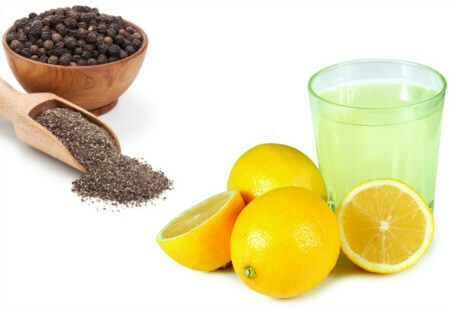 Black pepper also enhances the effectiveness of the lemon juice as well. Simply mix the juice of half a fresh lemon in a glass of filtered water. Add a few sprinkles of black pepper (4-6 turns of your pepper grinder) into the mix and drink 3 times daily. Ginseng is a strong stimulant herb that’s been proven to help speed up the body’s metabolism and regulate blood sugar levels. It also gives a potent energy boost (which is great for exercising) and increases mental alertness significantly. Of all the natural “performance enhancers” out there, ginseng is by far the best. You can buy Korean red ginseng (the best form) from most health food suppliers or online. Just be aware that when it comes to purchasing ginseng, the cheaper brands aren’t always the best (many use cheap, low quality ginseng). If you’re interested, this is the highest quality ginseng supplement we’ve managed to come across so far and works incredibly well… Auragin: Authentic Korean Red Ginseng. Fat is only good for you when it comes from natural food sources, not man-made or altered foods. Dozens of studies have now proven that unnatural fats from margarine, shortening and hydrogenated vegetable oils (this also includes the dangerous vegetable oils sold in clear bottles in supermarkets) can more than double the risk of heart attack in both men and women, along with causing infertility, sterility, breast cancer and prostate cancer. The reason these oils are so toxic and dangerous is they contain extremely high levels of trans fatty acids and free radicals. And as far as weight loss goes, these foods will do nothing but clog up your body (anti detox) and actually make you gain weight instead of lose it! So before you buy any diet products, check the label first. If it contains aspartame, avoid it like the plague! Coconut oil is a nutritional marvel. There’s virtually no health problem this amazing food can’t help with – and weight loss is certainly one of them! In studies, coconut oil has been shown to significantly boost metabolism and reduce appetite and food cravings. The MCT’s (medium chain triglycerides) in coconut oil also help the body burn calories by using up fat for energy. Of course, we now know that cutting good fats out of the diet will actually make you gain weight rather than lose it, so you must still receive a daily supply of healthy fats if you want to lose weight. And coconut oil, along with evening primrose oil, are two of the best sources. Adding fat’s from coconut oil into your diet can be the key to your weight loss success. Low-fat dieting actually causes weight gain and is one of the reasons for our current obesity epidemic. You can lose weight on these diets temporarily, but in the long run you end up gaining all your weight back, and then some. In fact, studies show that 95 percent of those people who go on low-fat diets eventually regain all their weight. That’s a 95 percent failure rate! My coconut ketogenic book explains all this in much more detail. Here’s the full interview here if you’re interested… Stunning Interview With Coconut Oil Expert Dr Bruce Fife. So to get your supply of coconut oil, take anywhere between 2-3 tablespoons of organic virgin coconut oil every day with or without food. And don’t be afraid of having too much. You can’t overdose on this wonder food so go nuts with it! You may have already read that a poor functioning thyroid gland (hypothyroidism) is one of the main causes of weight gain and one of the main causes not being able to lose weight. This is 100% correct. When you have an underactive thyroid, your metabolism slows dramatically. This is the reason why you still gain weight even if you don’t eat much. A low thyroid also causes severe fatigue and low energy levels. Of course, this makes it virtually impossible to exercise for weight loss and so a vicious cycle develops. You have a slow (probably non-existent) metabolism as well as no energy for exercising so the weight just continues to pile on. Thankfully though, this is relatively easy to fix. By taking in enough liquid iodine and/or kelp, you can easily stimulate and boost your thyroid gland so it begins working correctly and at peak condition once again. When this happens, you’ll literally start to see the fat on your body melt away before your eyes! For more info on hypothyroidism and the benefits of iodine and kelp for weight loss, make sure you take the time to read our informative article on this here… 10 Powerful Home Remedies for Hypothyroidism. Protein helps to convert loose fat into muscle, which is vital for weight loss and toning. Protein is also a great weight control aid as it not only satisfies the palette, it helps keep you fuller for longer. In addition, protein helps stop unwanted insulin and blood sugar level spikes in the body which occur when you consume certain carbohydrates (some carbs can in fact raise your insulin levels quite dramatically and cause sugar cravings and energy loss). So it’s always a good idea to eat some quality protein with a carbohydrate meal. Good protein choices include: Chicken and turkey (without skin and not fried), lean red meat (grilled not fried), lamb, pork, prawns, scallops, fish, eggs, low fat cottage cheese, haloumi, natural yogurt, nuts, seeds, and whey. You do need some carbohydrates as these help to fight the dreaded hunger pangs. Only ever eat natural carbs “from the earth” though, not anything that’s been refined or processed. Best sources include low glycemic (low insulin and blood sugar releasing) fruits such as strawberries, apricots, oranges, nectarines, pears and watermelon, and vegetables such as broccoli, cabbage, asparagus, celery and lettuce. Only eat a small amount of whole grains and beans (kidney beans, etc) too. And remember once again, not too many carbs! Sugar really is enemy number one for weight loss. If you consume high sugary foods and drinks you haven’t got a hope in hell of losing weight. Sugar spikes your body’s insulin and blood sugar levels like nothing else, and once this occurs the energy (calories) from the foods you eat then gets deposited into your fat cells. In addition to this, processed sugars contain lots of empty calories, which also get stored as body fat. And worst of all, refined sugars don’t fill you up as easily as natural foods and they’re also highly addictive so you naturally eat more! Of all the sugars, refined and processed sugars are definitely the worst. So all processed foods must be cut from your diet completely if you want to lose weight. Natural sugars (from fruits and vegetables) are certainly okay, however, we do recommend you stay with the low sugar varieties mentioned above to avoid any unnecessary insulin and blood sugar spikes. Some of the refined sugars and sugar containing foods you need to look out for and avoid include; dextrose, brown sugar, cane crystals, cane sugar, corn sweetener, corn syrup, corn syrup solids, crystal dextrose, evaporated cane juice, fructose sweetener, fruit juice concentrates, high-fructose corn syrup, liquid fructose, malt syrup, maple syrup, molasses, pancake syrup, raw sugar, sugar syrup and white sugar. Yes honey contains sugar (natural sugar), but it also helps promote fat metabolism and fat burning. Cinnamon regulates blood sugar levels and insulin levels and stops you from overeating (and is especially good for overweight people who are also diabetics). Used together, these two foods are a powerful weight loss combo. 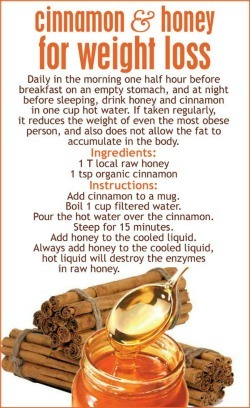 Simply mix 1 teaspoon of organic Ceylon cinnamon powder in a cup of boiled water. Leave to steep for 15-20 minutes then add 1 teaspoon of local or Manuka honey (do not use processed honey). Drink this concoction twice daily on an empty stomach. Eating less but eating more often is a sure-fire way to lose weight. Five to six small meals per day are far better than the traditional three big meals. It’s a lot easier for your body to digest and burn up small meals than big meals, and the added bonus is you never feel hungry. Just be sure to reduce your portion sizes and only eat until you feel slightly full but satisfied. Don’t eat until you feel as bloated as a pregnant goldfish! And never skip meals either. Your body will go into starvation mode straight away and start storing all of the calories you eat from that point on (not a good thing). This is the theory and basis behind the hugely successful book “French Women Don’t get Fat”. Eating from bowls, shared dishes or straight from the container (chip packets, etc) hides exactly how much you’re eating and is a definite no no. Only ever eat from a plate - no exceptions! If you do get a food craving then take a small amount of the craved item and put it on a small plate. Put the rest away. Sit at the table and slowly eat the food without distraction, staying totally focused on chewing and swallowing. Often this is enough to satisfy the urge. 100’s of calories are consumed sitting on the lounge watching TV. Every time you go to the pantry and grab some chips or biscuits, etc, and then sit back on the lounge, you’re setting yourself up for a weight gain disaster! Eating at the table does two things - first, it gets you in the habit of only eating when you’re supposed to. And second, it allows you to keep track of exactly how much you’re eating. So be sure to eat every bite at the table from now on! 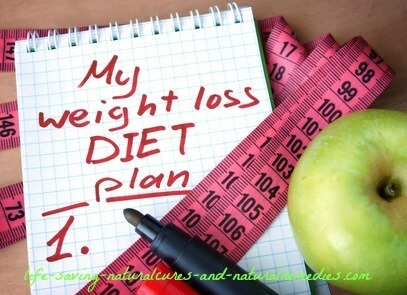 Natural Weight Loss Remedies #27: Keep an Eating Diary…. This is one of the biggest blunders of all people trying to lose weight. When you shop on an empty stomach those treats all look irresistible, but when you shop on a full stomach the cravings simply aren’t there as much. In addition to this, do not buy any foods that you know you may struggle with as far as cravings go. If you struggle with chips, for instance, don’t have packets sitting in the pantry. Every time you go to the pantry you’re going to see them and that’s not going to help your cause at all. And don’t use excuses such as “they’re for the kids” or “they were on special” or whatever. Just don’t have them in the house - period! You can’t eat what ain’t there! Then when you look at the current weight loss diets going around, it’s the replacement shake programs that are the big winners and money spinners. And even though these do work initially, they teach you nothing about proper eating, along with the fact that you can’t stay on them forever (and some of the ingredients in the shakes aren’t healthy either). The real life evidence shows that when most people come off these shakes, they put the weight straight back on, and then some! There is one last secret to losing weight that you absolutely must have, and without it, you’re doomed to failure. What is it? MOTIVATION of course! Without a strong enough reason to lose the weight you’ll fall over at the first hurdle that comes your way. And believe me, there’s going to be plenty of hurdles! For instance, ever notice when you decide to go on a weight loss program a friend will invite you over for coffee and dish you up a nice serving of chocolate cake? It’s going to happen, and you have to be strong enough and serious enough to say “no thanks”. How many people will go and lose weight for a wedding, or a life threatening health problem? How many parents decide to lose weight when they realize they can no longer keep up with their kids? Or what about when someone suffers a heart attack. That’s definitely a great wake up call to lose the weight (assuming you survive the heart attack of course). The bottom line here is this… when your reason is big enough, you can accomplish anything! In addition to this, don’t underestimate the awesome power of the mind for losing weight. You must focus on “thin thoughts” if you want to become thin. Visualize yourself as the size you want to be right now. Vow to only ever see yourself as thin from this point on, not overweight. 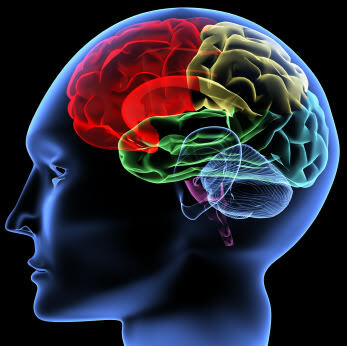 “If you’ve been there in the mind you’ll go there in the body” say’s mind power and visualisation expert, Dr Denis Waitley, and it’s true. Get yourself a copy of the book The Secret by Rhonda Byrne and read the weight loss chapter over and over till you can practically recite it! Oh and one last thing. Don’t forget to make “losing weight” fun. It really doesn’t have to be this drudgery. It can be fun exercising and eating healthy (yes it really can!) It’s up to you whether you want to make it that way or not. 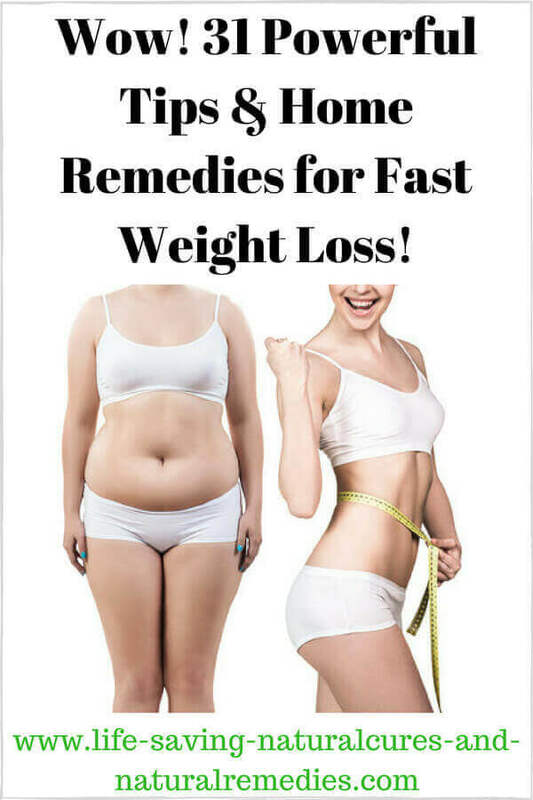 Sources and references for this article include: weightlossforall.com, mercola.com, top10homeremedies.com, homeremediesweb.com, stylecraze.com, rapidhomeremedies.com, everydayroots.com, Sawyer, Troy, How to Increase Your Energy, Cure Poor Health and Enjoy Living Longer!